There are an increasing amount of job openings for 'digital' positions at agencies and brands these days. How do you get a break at these 'digital' jobs? How do you get hired for these "digital" jobs? How do you move up the ladder? What do you want to do, really? What do you want to do in 'digital' at an agency? 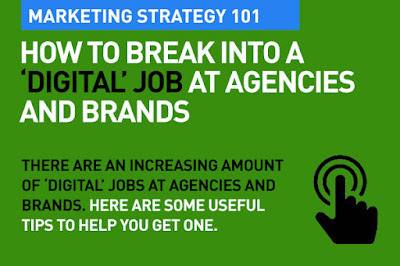 The first step is to have an idea of what you want to do in the 'digital' world at an agency? There are plenty of jobs across the whole digital spectrum and they may be in advertising, media, social media or PR. They may be in the creative area, in strategy, in media planning and buying for the digital age, in content creation and distribution, or in digital design and development. There are specializations and jobs in social media, in influencer marketing, in usability, performance marketing, in data and research, in Search (SEO, particularly), online marketing, mobile marketing (both mobile advertising and.or apps etc). There are now job titles and job openings every day. Some are new and unique and are reflective of the ever changing world of digital marketing. We used to have creative directors who did a bit of digital. We used to have digital specialists like coders and app creators. Today we have 'creative technologists'! In social media, we had community managers and strategists. Today we look for 'social insight managers' and in media we hunt down data miners and information engineers. What kind of agency do you want to work for? What kind of an agency do you really want to work for? Today there are several kinds of agencies that offer digital services – and are looking for digital people. They may be 'pure-play' digital agencies (only do digital such as online and mobile design and development and production) or 'hybrids' (do both offline and online). Pure-play agencies are often drilled down depending on their specializations – web design, web development and coding, SEO/SEM, mobile, UX, and social media. I must mention here that while mainstream or brand agencies are heavily into social media these days, and offer services across all of social, there are specialized social media agencies as well. Two big agency models are 'mainstream advertising agencies and media agencies (here's what a media agency does). And, today, the lines are blurring, and media agencies, because of their huge bank of data and insights are also doing creative. That, is a whole new window of opportunity. Of course, you'll hear a lot about "going back to the old days model" – which is really about how some agencies are fully integrated or 360°– and offer across the spectrum. Take a look at some of the jobs listed by MCN (Middle East Communications Network) – one of the largest advertising, media, PR and specialized communications agencies groups in the Middle East. 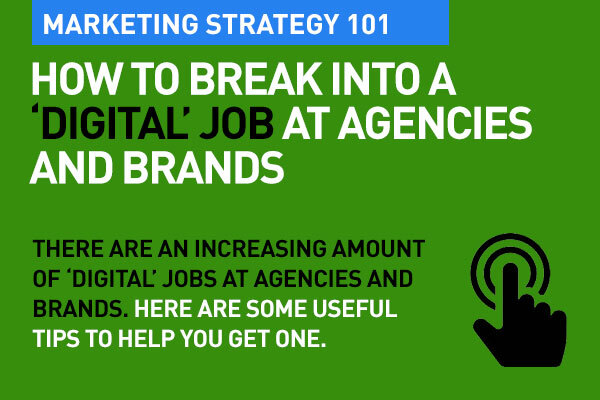 You'll get a drift of some of the jobs that are on offer in digital at their different agencies. Research the job you have in mind. Research everything you can about the agency where you're thinking of applying. What do they do? Who are their clients? What are their real specializations? What's required of the role? Where do they have offices? Are they a local agency or regional? Or part of a global network. All of this insight will help you not only get a foot in, but once in, that will give you an idea of how much 'ladder' there is, and how to climb that. What's most important is to try and figure out about their 'digital' capabilities – and their digital clients. What kind of work do they do in digital? Your research should give you enough information to create a great first impression at an interview. Or even before that, it gives you all the word power you need to make your application cover letter effective and as well 'customize' your resumé. What's the culture of the agency? What's the usual dress code? Which accounts did they win, or lose? You'll have to dig far deeper than just the company website to get proper insights – so work hard on social media. The key is identifying your specialization in digital. Some jobs in agencies require specialized skills. Some specialized agencies today offer unique services in UX, usability and CRO – and needs certified skills at top levels. You'll need a broad base understanding of digital first, and then a deeper knowledge of the specialization you are interested in. You won't be coding programs or building full websites as a digital agency person, but you will need to work with developers and designers or other web specialists to communicate your marketing design needs. Linked-in is a great place to start. Not only do agencies have career pages on LinkedIn, but you'll get a whole lot of insight on the agency, the people there from LinkedIn. Check to see if your contact bases across social media are somehow connected to the agency you want to apply to, and leverage that. Call people you know who may be able to offer you a tip on the job, the agency, the people you may be interviewed by. And, it's not just LinkedIn, look across all other social platforms. Both Facebook and Twitter are amazing sources of information. When you want to move to an agency, your CV and portfolio needs to be top notch. In the old days, the creative folks would have a 'bag' (a large flat black case with their creative work filed in clear acetate covers). These days, for digital, you'll need all your work on your laptop, or uploaded on to a website. In fact, the website is much better to show off your work, because the link always stays with the agency team, they can look at it, share it, and decide later. You don't necessarily need to have your own domain and owned website (that is a plus, though), because there are so many free online portfolio sharing options. About your CV: customize it for each job, each agency. Make it look like you want that particular position at that particular agency. Keep your CV short, and to the point. But do be specific and ensure that it addresses what that digital position might require from both experience and expertise perspectives. Spellcheck. Double spell check. Grammar check. Remember, if you're emailing, get your subject line to work for you. Brands and agencies know the importance of the email subject line. So should you. Research your topic. Digital is constantly changing, evolving, and you need to be absolutely up to date with the latest trends, industry news, technology, consumer behavior and more. There's so much information available, that going in uninformed these days is stupid, really. If you are applying for a job in social media and you don't know anything about Snapchat. Stop. Learn. Stay tuned with digital focused portals like Mashable, Wired, digitaltrends, MediaPost, The Verge, etc. Your interview, your cover letter, what you say across the table are all reflections of how much you really know about digital in general, and about the specialization you want to be in. It's key that you don't come across as shallow and that your information is out of date. Be on trend. Ask questions, follow up, persist. Digitally. Ask questions that are relevant at the interview. Ask digital centric questions, that, somehow reflect both your interest in the field, in the niche you want to be in, in the agency and the position. Not about how much sick leave you'll get. Follow up your interview with a thank-you email, again be specific, make it personal, and relevant to why you should be hired. If there's an interesting development in digital, mention it. If you haven't heard back, persist, but don't be annoying. Showing up at the agency reception is not a good idea – sending a quick email with a relevant bit of add-on value (digital info, perhaps) is better. Play the part. Be 'digital' 24/7Not just at the interview, not just for your job hunt, you need to play the digital part 24/7. Be aware of what's going on. Attend conferences. Show up at tech fairs. Subscribe to digital newsletters and updates. You don't need to be a geek, but you need to have digital at the heart of everything you do. Agencies today often search on LinkedIn and other social media for digital candidates. Be findable. Be visible. Be digitally eloquent across your social presence. Make sure you are passionate, without faking it. Speak the language. I just want to say, from what I know because of where I work and what I do, that today, there are more digital job openings than proper qualified candidates. And don't forget that this whole post applies to digital jobs at brands these days as well. And that's the basics of digital marketing strategy. That's 101. If you want to add to this, or feel I've missed something that's basic, please add your bit in comments. Great article and I support your thoughts .thanks for sharing the original article. Always look at the reasons why you want to work for an agency and why you want to choose a brand. Make a list to help you find the best fit for your aspirations, personality and digital marketing career destination. Digital Marketing Strategy is a broad term that encompasses a wide variety of tasks, all involved in the formation of web pages.